I recently got back from a month-long trip. On the leg between Denver and San Diego, I made a point of talking to the people I came across. Every once in a while, I’ll notice something and get the urge to talk or ask about. Most of the time I don’t, simply because I have other things to do or because I convince myself I’m too busy. However, after traveling for four and a half weeks straight and meeting all sorts of different people, I started to not really care. Besides, the last time I met a stranger and started talking to him, I learned some valuable life lessons. Instead of making this something that I would dread or regret, I took a page out of my racing plan and turned it into a game. Instead of worrying that I’d annoy or bug someone by talking to them, I decided to find a topic of conversation, even if the other person was annoyed. These victims, err, targets, err, strangers turned out to be very friendly. Here are the surprising results of just one week of talking to strangers. EA was my cab driver. I don’t mind talking to cab drivers, but I often work while I’m taking a cab, so I don’t have time to talk. However, this time, I was rolling up to my AirBnB late at night and I didn’t have anything pressing to do, so I started talking with EA. After posting up in my go-to coffee shop in Fort Collins, I ran across a guy holding onto Diane Sanfilippo’s book and The Paleo Solution. As someone who runs a big paleo site and who’s released a paleo app, I had to ask him about his books. I saw Adam from across the coffee shop and noticed he had an Antarctica sticker on his computer. I’m not a South Pole expert, but since I’m going there this winter, I’ve been on the lookout for people who know what they’re talking about. Most people don’t randomly have a picture of the southernmost continent stuck on their computers, so I asked him about it. It turned out that he’s a student researcher at CSU and that he heads down to Antarctica for a few months every winter to handle some research. Cool! We compared notes on the trip and on the location of my ultra marathon and the guy blew my mind (did you know that Antarctica is almost twice the size of Australia?). I got a few pro tips from the expert and was on my way. Such an awesome connection. When I got onto my flight from Denver to LAX, I noticed that something was a bit off. It wasn’t a typical flight. This sometimes happens if you’re flying in first class, so it took me a while to figure it out. 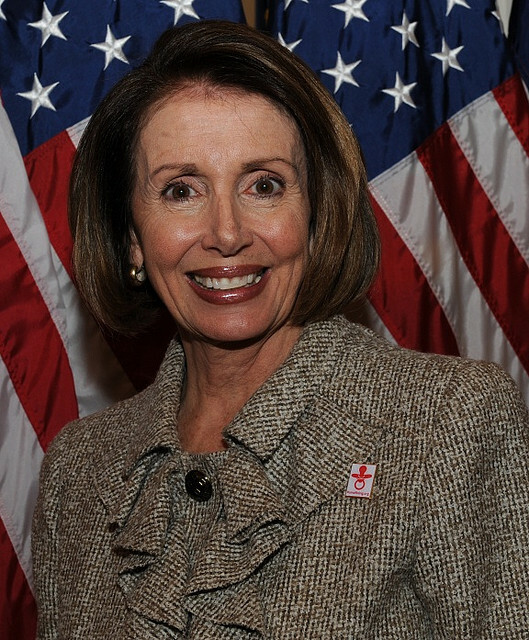 Then I looked up and I could have sworn I saw Nancy Pelosi. I did a double take, put two and two together, and realized that it was her. I assumed the big man in the suit next to me was her security guard. I’m not very political, but it’s always interesting to see politicians up close and personal, especially when you could reach out and touch them (I could have kicked the back of Nancy’s seat). My initial reaction was to keep quiet and not do anything that was going to get Homeland Security onto me. After we took off though, I was curious, so I asked the guy next to me what they were going to be doing in LA. As it turns out, he’d been working for Pelosi for a while, but also was quite involved with a few other charities, one of which builds schools in Haiti by organizing marathons. Hmmm. I know someone who does that too! I got to share a little of my story and to talk about The 777 Project that we had just launched. I met Gayle on my flight from LAX to San Diego. Although I’d figured it’d be a short flight that I’d use to catch up on sleep, I jumped into a conversation with Gayle as soon as I sat down next to her. I got to find out about her favorite cities (Chicago and London) and her top five cities in the US for food (Las Vegas, Chicago, NYC, New Orleans, and San Francisco). Even though there were over thirty years between us in terms of age, we had a lot in common. We were from Chicago, living in Southern California, and spent a lot of time traveling. We both ran our own businesses and were working on major philanthropic endeavors. The flight was short but went it by even quicker because of the conversation we had. By the end of it, I had made a new friend. Goals are things we hope to do. Commitments are things we will do. Over the course of the trip, I made a bunch of new friends. None of those relationships would have been formed if I had insisted on glueing my eyes to my phone and keeping to myself. I’m not an expert on this, since I only just started experimenting with it, but here are some of the things that have helped me immensely when it comes to talking to strangers. If you wait for someone else to start the conversation, you might end up waiting forever. I’m not a fan of waiting. If you want something, you should go after it and make it happen. Be the one to stretch out your hand and say “hi.” If the other person says no in some way, there are approximately six billion other people in the world you can be friends with. If they say yes, then you’ve just made a new friend. I get it. You care about you. A lot. But most people (especially strangers) don’t. That’s okay. If you’re stuck for words, ask your new friend about him/herself. People love to talk about themselves. Ask questions. Listen. Ask again. Repeat. When stuck, follow the next suggestion. This is a bit tougher because you can’t give much in the way of tips other than “be human”, “listen”, and “improve.” Just be human, find a common point, and keep asking questions. It’s hard to do any of this if you’re head-down in your phone. Yeah, it’s probably easier to stick your head into your phone than to look up and make friends with a complete stranger, but your emails and tweets will still be there later. They’re not going anywhere. However, you might not get another chance to connect with that stranger. Take advantage of the opportunity. If all else fails and you don’t know what to do, just walk up to someone and say “hi.” That’s all it takes to get a conversation going. You might connect and you might not, but you won’t know until you try. If nothing else, you might get a good story out of it. Good one, especially the one about looking at your phone. It’s sad how people are so engrossed in their cellphones these days, they’re unaware of their surroundings. Go to a restaurant and you see every family member at a table buried in their phone. They don’t appreciate what’s around them. totally agree with you and i can tell from my own experience that it is always worthwhile to keep your eyes and ears open. I backpacked for almost 2 years through China and South East Asia and the best way to get tips and find awesome destinations was talking to strangers. After that i lived for 12 years in China and it is absolutely common to talk to any stranger you meet, no matter where. It was amazing how many interesting people I met in this way and even now that I am back in Europe I talk and meet strangers on my way with the result of getting in touch with the most interesting people. Awesome! A must follow.. being involved in my startup i kinda lost connect with the world. suddenly from having tons of friends, i was left with only a few and that too they were not in the same country. From partying every weekend, going on trips, etc ,etc to not having people to speak to! 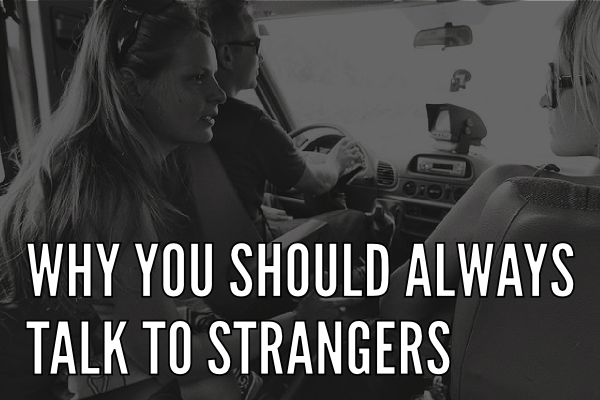 I was had people around me so never had the urge to speak to strangers or to make new friends. But now things had changed. I had to some thing. i was kinda going nuts as there were no friends around. I’m impressed how you continue evolve and try to better yourself while in the process improving and having a positive impact on the world around the things even if they seem like small things. It’s very inspirational. This post is a good one that breaks the conventional wisdom most of us were taught as kids which is not to talk to strangers. I’ve also found that when talking to strangers or when someone just start talking to me, even if they/I was submerged in negative thoughts, suddenly they become positive. We even start to smile as well. It’s quite interesting and amazing. i have gone through a lot of fortunate incidents like that and because of that i have a boyfriend.,People needs to stop wasting their time on social media and start concentrating on their lives and explore their own hidden talents.Life was so much better when social media was not there…what do you think? Reading this article makes me feel I’m not that weird when I do that hahaha great post dude! I am following your blog for many years and it’s good to know that you are still on your adventure. Good luck bro. Keep it up and show what you can do.